Is the monorail still there? If not, can someone share the history of it? Oh damn; that is what the future was supposed to be like! What the heck happened? Anonymous: The monorail isn't there anymore. As for its history, did you read my last Fairlane post (which I pointed out and linked to in this one)? It went into some detail on the monorail. I hate that futuristic is dead. Sad really when it comes down to it. I personally wished I had been at Fairlane in it's heyday. Malls in my town would make a big deal to do things like having electronic mall directories or other futuristic elements that made growing up seem worthwhile. Now I feel 'ruined' and spoiled over the way it was that it's sad seeing where it is today. Still I thought they did an interesting job with renovating their auditorium when I bothered passing by. And because I have NO LIFE, I stuck these up on YouTube from a video my high school bothered throwing up while I still went there, listing different courses they offered in their Vocational Center (now called "Career & Technology Center", a rather stupid name in my opinion, similar to the changing of Home Economics to "Family & Consumer Sciences", it's just a stupid longer name I don't want to remember). A few classes where dropped over the past 20 years from what I could gather, though I never took any of those classes as I wanted to go College Prep. on my own. My younger brother took Commercial Art though, yet he currently works for a furniture warehouse (go figure). I guess I want to blackmail/get even with my ala mater in a way that's TOO cynical, even for me, but I felt I deserved better treatment than the way it went (I didn't even bother going to my Class of '96 reunion last year because I didn't have enough wad to blow on the ticket, let alone get all dressed up for whatever goings on will ensue)! Fairlane is still a very nice, well-maintained mall. It might not have all it's special details from the 70's but the overall character is still there and it had aged well. You can even still see the portal on the outside of the mall where the peoplemover entered through the side. The hotel is also very nice with it's atrium lobby. The future is still very alive there as well. Unfortunately, the peoplemover trackway became a maintenance issue and needed to be torn down. Ford's intent to market this prototype system never came to fruition. As for electronic mall directories, Hayward's Southland, (one of Taubman's first malls), had a very cool directory where you could push buttons next to the names of the different stores and a light would illuminate on a floor plan to show where they were in the mall. It was a pretty cool item for the late 1960's. I can imagine the maze of wires that was inside this thing. Does anyone else here remember encountering anything like this? ...perhaps at other Taubman malls?? Off-5th outlet about 5-7 years ago, and ended up with just one floor open, the upper floor abandoned. As of December 2007, it's going out of business. Lord and Taylor went under last year, and that ear of the mall is now walled off. There's now a lot of Mom and Pop stores in there-stores with no merchandising savvy, hair salons, lower lever retail stuffed into architecture that's obviously left over from previous national tenants. I grew up in Dearborn. Sears was the first store to open, before the mall itself did. We pressed our noses against the glass doors from Sears to the mall, trying to get a look at what it would be like-and it was very, very cool. The monorail was the coolest, but it only went to Hyatt-and as a shopper at Fairlane, there really wasn't a reason to go to Hyatt-so everybody tried riding the monorail once, then forgot about it. 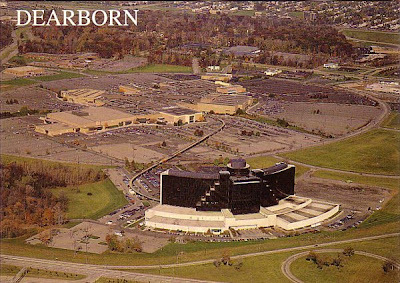 There are newer stores in the mall, such as H & M, but the people of Dearborn don't much go to this mall at all, as they don't really seem to feel safe there anymore. My guess-razed in seven years or less. I grew up in Dearborn Hts. and went to Fairlane all the time with my mom and had lunch often at the Hyatt at what I remember to be somewhat of an open restaurant, I think on the 2nd floor, it wasn't enclosed with a wall or door you had to go through to get in. Fairlane was such an upscale mall with lots of great shopping, and as a treat being able to ride the monorail to the hotel. I've since moved to another city with its own mall, but the last time I went there I couldn't get out fast enough!!! There was nothing there for me, and I just didn't feel safe. I was sooo incredibly sad to see this monument from my childhood in virtual shambles. On March 4, Anonymous wrote about the open restaurant on the 2nd floor of the Hyatt. I was also from Dearborn Heights and frequented Fairlane in it's heyday on the late '70s and into the '80s. The Hyatt restaurant was called "Kafay's Place". We always took the cool elevator ride to the 2nd floor and ate there often. Good food and they always had fresh fruit with every meal. I was just shopping at this mall today and liked the retro-atmosphere so much I decided to look it up online. Sunday at 2PM got the 4th parking spot from the door to JC Penny entrance (not a lot of customers). The interior is quite devoid of shoppers (which actually makes me feel safe). Saw some of the huge Chris Bayer 2 and 3 story geometric sculptures. It still looks like the 70s. Macy's and JC Penny were doing a decent business. The 'scary' element of roving bands of kids isn't around (Fairlane implemented strict under 21 rules after complaints, but also after the Rev Al Sharpton led a protest after some shoplifter died of a heartattack while being arrested). Now it's mainly moms+kids or groups of 2 or 3 people. No more gangs-but not too many other humans either. Back in the 80s it would have been packed with shoppers (and groups of 10-15 kids shooting dice while laying right in the middle of the walk-way so you'd have to step over them-I'm not making that up). I also remember in the 80s watching a 15-year old (?) kid dressed all in green and walking with a pimp-cane paying $15,000 in cash to buy a watch! The cashier says, "I'll have to fill out an IRS form"...but then the kid whipped out the cash and they didn't fill out any form. I was also there two days before Christmas this year and it was empty then too. Basically, everyone was either scared off: by the crime, or the cops; the new rules for kids; Al Sharpton; the huge Jewelry heists with smashed glass counters that happen every Novemember; or the economy. NOW: it's a nice, empty Mall with JC Penny's, Macy's, Footlocker and tons of other name brand places (plus lots of weird mom and pop oddities)...and tons of brown molded pebble conversation and play "pits" and huge sculptures and whild retro architecture. I was there when I was 4, four years after it opened. The pool had water fountains that looked like candles too me with the light next to the water flowing into the pool. When I was 8 I came back. The hotel was kinda nice & the pool was disapointing already....no fountain..tho the fnt pillars still stand & I specifically remember my mom saying...I. can't believe they are not keeping this place up!